How To Clean Upholstery Tips And Instructions :: My Cleaners London - Only professional cleaning! Learning how to clean upholstery can be important in any home that you want to stay looking clean, beautiful and well cared for.This is because no matter how carefully you take care of your upholstered furniture accidents do happen. A spill can happen quickly, and when it does time is of the essence. Plus, even if you are fortunate enough not to actually spill something, general dirt and dust can accumulate as part of normal use. Therefore, below I explore upholstery cleaning tips, homemade and commercial upholstery cleaners, and even give you a chance to give your own tips for cleaning upholstery. I am focused on this article mainly on fabric upholstery. Leather or suede upholstery has different cleaning and care requirements. 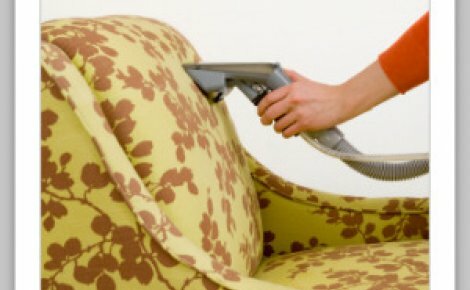 If your upholstery starts to look dingy, or has developed lots of stains and spots, before you do anything else it is important to vacuum it. This will remove the dirt and dust which, when wet, can further dirty your couch if it is not removed first. 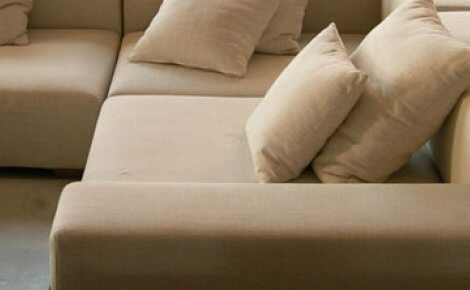 Use an upholstery attachment to get in all the cracks and crevices, and to thoroughly clean all the cushions. In addition, remove as much pet hair as possible. If a vacuum itself does not seem to get it all, try a pet hair remover. If you don't just have general dirt, or old stains, but instead a fresh spill, you don't want that spill to soak into the furniture stuffing, into the wood, or to set into the upholstery fabric. Therefore, the first thing to do when any spill occurs is to blot (not scrub or rub) the spill up with a white cloth as quickly as possible to lessen the spread of the stain, and to keep it from setting in a larger area. Next, you need to know what types of upholstery cleaner should be used on your upholstery. This is dependent on two things: (1) the type of fabric the upholstery is made of; and (2) the type of spill or stain on the upholstery. Each will be addressed in turn. Upholstery fabrics can be mystery sometimes, because the fabrics used for upholstery can be varied, such as cotton, wool, silk, acetate, linen, rayon, olefin, and acrylic just to name a few, including blends of these fabrics. In addition, different upholstery fabrics have been dyed with different colors, in different ways, and the age of the upholstery should also be taken into account. Note, if this is very old upholstery, or antique or very valuable, I would suggest calling in a professional. If you have removed it, read on for future reference so you can know why you actually want to save those tags, and I'll explain what you should do when you don't have a tag further down. The furniture industry has created a code for its care tags so you can quickly know how to clean upholstery when a spill occurs. These tags are typically found hanging in an inconspicuous place on the side of the furniture, or under seat cushions. W: Clean the upholstery fabric with a water based detergent. S: Clean the upholstery fabric with a water free product, such as dry cleaning solvent. With all cleaning methods I would suggest that you test your upholstery stain remover first in an inconspicuous area, to check to make sure the stain removal method will not harm it and for color fastness. This would be an even more important step when you don't have a upholstery tag to rely upon anymore. You also do all stain removal on upholstery at your own risk, especially when you don't have the codes. If you are unsure, or want to be especially cautious, I would call a professional for advice or assistance on how to clean upholstery without tags still attached or accessible. I also suggest when you don't know the codes or the stain, start with the most conservative cleaning method and proceed cautiously from there. If you don't know what upholstery cleaner can be used on your upholstery the first step is to look at the tag. You haven't removed the tag have you?